Graduation was 2,000 miles away. I needed something to carry The Stash Couture Wardrobe across the US. 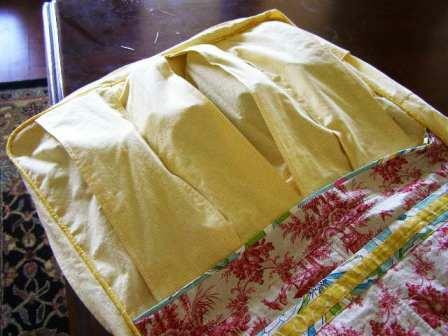 I had already engineered and completed the Carry-On, but the dresses and skirts would need a dress-sized garment bag. 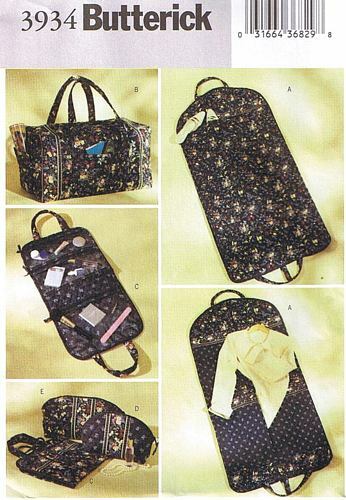 I had some pieces of the fabric used for the Carry-On left in The Fabric Stash, so I dug through The Pattern Stash and found Butterick 3934, which I am fairly sure has been discontinued (it is dated 2003). 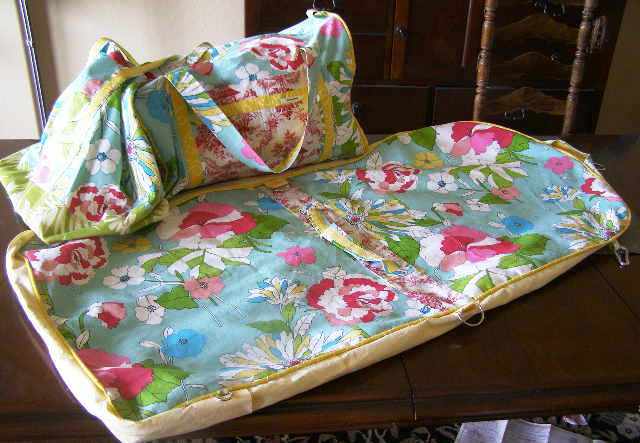 The Garment Bag front was almost exactly the size of the blue floral fabric I had left. I did, however, have to piece the red toile to create the back. As the red toile was quilting weight, it was interfaced, lined, and quilted. I did have to purchase the upholstery weight yellow gingham for the sides and shoe pocket, so this is not quite a 100% Destashification Project. 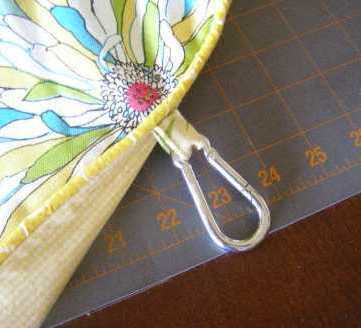 The pattern has a center zipper. I moved it to the sides. My Stash contains several 24″ and 72″ metal upholstery zippers still proudly exhibiting their 50 and 99 cent clearance stickers. The 72″ zipper worked great for this project. I used one of the shorter zippers to engineer a set of four shoe pockets. The pockets were sized to fit two pairs of my shoes – for this trip it was sandals. 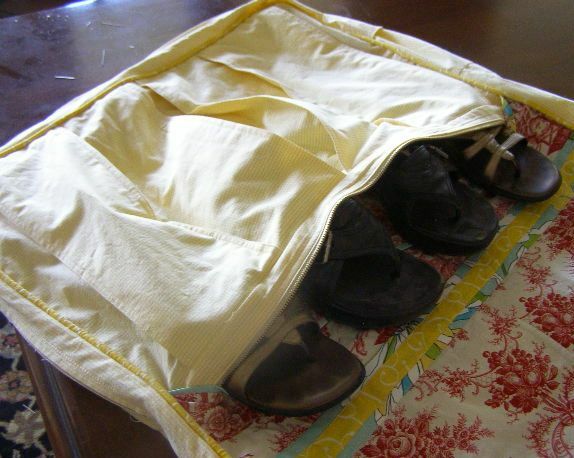 No heel or scuff marks from traveling as the pockets are designed to keep the shoes separated! 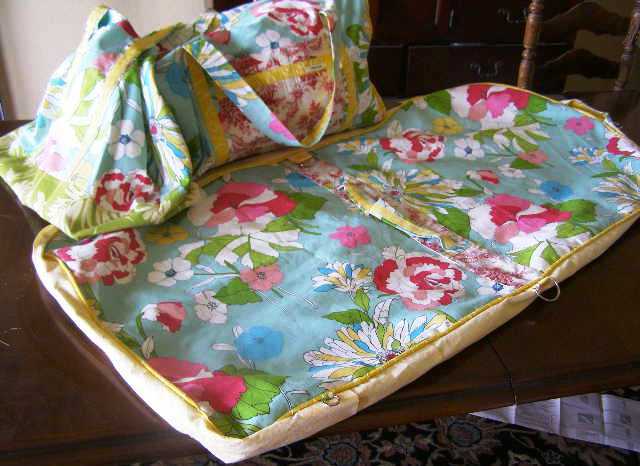 As the dwindling stash of coordinating fabric would allow, the Garment Bag was reinforced with cording and fabric strips, especially at the handles and edges. Hardware Stores are one of my favorite places to wander. A true hardware store has drawers and drawers of different connectors, clips, handles, etc. I knew I would need hardware as clasps, but did not want to add too much weight, so I choose aluminum clips. The D-rings were in The Stash. Finished in time for the graduation trip, the dresses and skirts arrived needing only minor touch-ups with an iron! For a few hours of sewing, I now have a Coordinated Tote, Carry-On, and Garment Bag. The total cost for Stash Couture Luggage Set was less than $10! 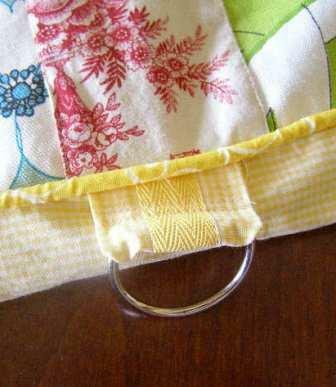 This entry was posted in Accessories, Sewing, Stash Couture. Bookmark the permalink. I love that idea! I just started sewing and wouldn’t have thought of doing luggage (at least a garment and shoe bag). What a great idea. I also love your fabric you’ve chosen. I travel every other month or so for work. I struggle to find luggage items that fit my needs. Depending on the hours I am working I am required to wear different types of clothing from Dress wear to business casual and casual attire. I really think this is a fantastic idea. With the dress bag, and carry on I can cover most items I would need. The tote is a perfect side kick for those must have road and late night snacks. I might even add a lightweight laundry bag for the trip back home. Thank you so much for the incredible ideas and fantastic images. Now where to find that great pattern…on the hunt.